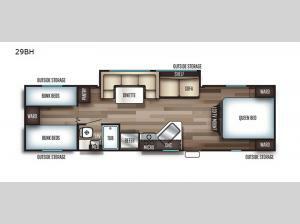 This Cherokee Grey Wolf travel trailer has abundant storage both inside and out making it easy to take along all that you need and want without leaving anything behind. There is also plenty of room for ten to sleep so that you can even let the kids bring a friend or two. They are sure to love having their own rear bunkhouse with two sets of bunk beds, a wardrobe to keep things tidy, and even a curtain for them to have some privacy. With the sofa and U-shaped dinette on the large slide, you will find it comfortable for meals or even board games and cards in the evening. When it is time for bed, there is a queen bed up front that you will enjoy a good night's rest on with wardrobes and nightstands on either side for your personal items.